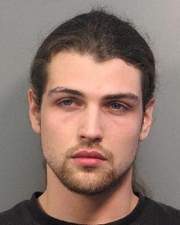 A 22-year-old man from Louisiana has been arrested on charges that he possessed images of children engaged in sexual activity on his computer. The suspect, Nicholas Chambers, of Sibley, was apprehended by authorities after they received a "disturbance call" regarding him sometime on Sunday morning. Detectives say they searched Chambers residence and during a quick preview of his computer recovered at least six pictures thus far as well as drug related paraphernalia. A full examination of Mr. Chambers computer could result in more charges.